1944: World War 2 is raging and the fate of the world hangs in the balance. Adolph Hitler has embraced the supernatural searching for weapons to ensure the victory of his Third Reich - - and hes found it! His secret servant has stolen Thunder Girls mighty powers and created three super stormtroopers who are wreaking havoc on the Allied troops! 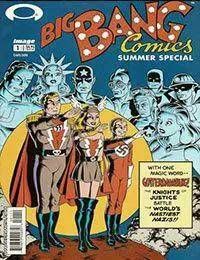 THIS ISSUE: The Knights of Justice go to war to battle Hitlers living Blitzkrieg. It is a battle of champions as the blitz races against death in the guise of the Hitler Youth! Venus battles for the souls of innocent soldiers with her old foe Mary Death, who has been reborn as the Valkyrie. Ultiman faces off against the super soldier Kaptain Thunder while the other Knights contend with that snake in the grass, the Secret Servent!